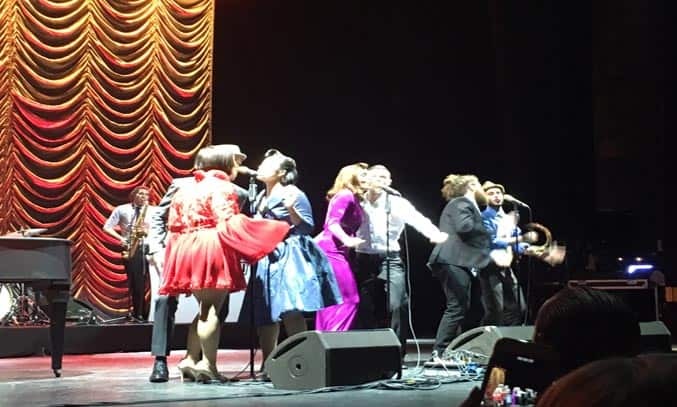 Scott Bradlee’s Postmodern Jukebox brought an authentic 1920s vibe to Manchester’s O2 Apollo last night as the rotating music collective rolled into town as part of the UK leg of their European tour. 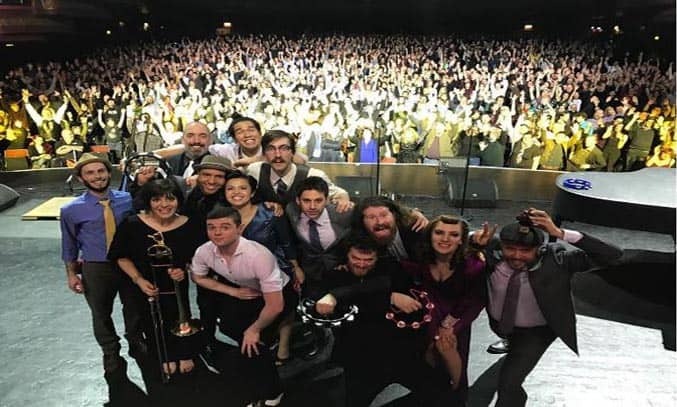 Founded by Jazz pianist and arranger Scott Bradlee in 2011, Postmodern Jukebox (PMJ) first found fame through YouTube. Starting out as a basement project, the US group quickly became a viral sensation, racking up over 650 million YouTube views and a number of worldwide tours which have sold 220 thousand tickets to date. The group is best known for their reworkings of modern pop, rock and R&B songs into vintage-pop mash-ups ranging from swing and doo-wop to ragtime to Motown and cover a new tune every week. PMJ’s latest European tour sees group cover songs from their whopping twelve albums, as well as tracks from their new album THE ESSENTIALS which is due for release in the UK on 6 April. With more than 230 songs in their extensive back catalogue, PMJ are certainly not short of hits, cramming in over 20 songs into the two and half hour show. The set kicks off with an incredible rendition of CALL ME MAYBE performed by male vocalist Von Smith. Back-to-back hits such as Britney Spears’ WOMANISER and N-Sync’s BYE, BYE, BYE quickly follow, as well as fan favourites such as ALL ABOUT THE BASS, GIVE IT AWAY and MY HEART WILL GO ON. Fans of PMJ will know that no two PMJ shows are ever the same thanks to their rotating cast of talented musicians, vocalists and performers. The latest UK tour sees a cast of five top-class session musicians playing piano, strings, horns, drums and double-bass, as well an all-star group of vocalists (three females and three males) who take turns at both lead and backing vocals. In terms of vocalists, Casey Abrams is clearly the favourite with his interpretation of Radiohead’s CREEP and Sam Smith’s I’M NOT THE ONLY ONE receiving a rapturous applause from the crowd. Host Ariana Savalas also steals the show with her brilliant jazz Ginuwine cover of PONY in which she gives an unsuspecting member of the audience a hilarious lap dance. Mid-way through the set sees Scott Bradlee himself appear on stage. The musical director doesn’t always perform with the group as he’s so busy producing but flew in from LA to perform a special piano mix of THRILLER, WONDERWALL, GHOSTBUSTERS, HEART OF GLASS and PIANO MAN as requested by the audience. Another highlight is Alexander McDonald (PMJs touring tap dancer) who takes centre stage during to perform a tap dance mash-up of MAPLE LEAF RAG, IN THE MOOD and SUPERSITION. While PMJ certainly appear to have fun on stage, for all its relaxed air, this is a slick and polished performance. The only real disappointment is the venue itself which is a little too big for an act like PMJ. The group are clearly too popular for a smaller venue but the showmanship and intimacy of some of the numbers is lost in a venue of this size. That said, PMJ are clearly a talented bunch and there’s not much that will stop the audience from having fun or getting to their feet for the encore of STACY’S MOM and SHAKE IT OFF. All in all, a saucy, sassy and stylish night out that is sure to leave you with a smile on your face. Scott Bradlee’s Postmodern Jukebox tours until April 2017.